[cryout-button-color url=”#” color=”#47AFFF”]I admit I am not a guru. [/cryout-button-color] I am not a trainer for the stars, creator of the “300” movie workout programs, and the truth is I don’t even hold a current certification as a personal trainer (mine expired long ago…but I did have one). Ok, so I am not a fitness training guru, but I am however, an avid gym rat that loves to be fit. I specifically like to keep myself in the best shape I can in relation to having as much strength, flexibility, and cardiovascular health as possible that is directly usable in a fight. “Fighting fitness” is my primary goal, although I readily admit I love to lift weights! My purpose for working out is to be fit to fight! But I readily admit I enjoy the bodybuilding side of fitness as well. This article focuses on a functional, cardio based circuit. wasting it is the last thing I want to do. That brings me to this post. Fitness is really important to me. More than that, I simply love to work out and be in shape. The extremely beneficial side benefit is that being in shape directly applies to my ethos of “Until Then – Train Hard.” Being physically fit (prepared) is a key in my mindset. If you have read any of my other posts, you certainly know I am a gun guy and write mostly about shooting. I decided to share a different side of my training today, and am going to give you one of my favorite fitness circuits. My personal fitness goal: To be in the best functional shape I can be. What function am I training for? A fight! So my goal is to possess strength, cardiovascular fitness, and enough flexibility to survive and hopefully thrive in a fight. My second goal is purely cosmetic, as I like to be muscular and strong. Truthfully, I have loved bodybuilding and all things related to it since I was a young man, and I enjoy lifting weights more than any other fitness related fitness activity. Luckily, since I don’t purely specialize in bodybuilding, my weight training is directly applicable to building big and strong muscles that are usable in a fight. This particular article will focus on one of my cardiovascular oriented fitness circuits, of which I do one to two per week along with one longer recovery type session. This one is my favorite circuit. I want to apply the intelligent principle of minimum effective dose (M.E.D.). This term simply means that I am going to apply the minimum amount of work to get the desired effect. I don’t have extra time on my hand, so what I do needs to be fast and effective. I plan around 45 minutes for each workout, including my weight workouts and I firmly believe that if you follow a routine with a plan, and avoid socializing, you can accomplish a remarkable workout in this amount of time. My choses exercises are ones that most directly meet the goals I have chosen, and most of the ones in this particular routine are doing both strengthening something while working my cardiovascular system at the same time. I maximize my use of time. I designed and refined this routine to use every single minute of it, even my rest periods. This routine follows the high intensity interval training (H.I.I.T.) training principle, but more specifically is what Joel Jamieson describes (in his book Ultimate MMA Conditioning) as Cardiac Power Intervals. Per Jameison, “this type of workout stimulates an increase in the contractile strength of the cardiac fibers along with a corresponding increase in mitochondria.” This program should also be balanced with additional workouts that raise the heart rate to 130-150 bpm for 30 minutes or more. Each interval of training (exercise) should last 60-120 seconds. I keep mine at 60 seconds each. Total time for this routine is around 45 minutes including the warm up and cool down. After each exercise, a rest period should follow that is 2-5 minutes, or until the hear rate drops to around 120 beats per minute. A heart rate monitor is highly recommended in this routine! During your rest set you will be stretching the muscle group that you just worked, with one minute dedicated to either side of the body. Remember to breath when you stretch, and do NOT force the muscle to stretch, allow it to instead. 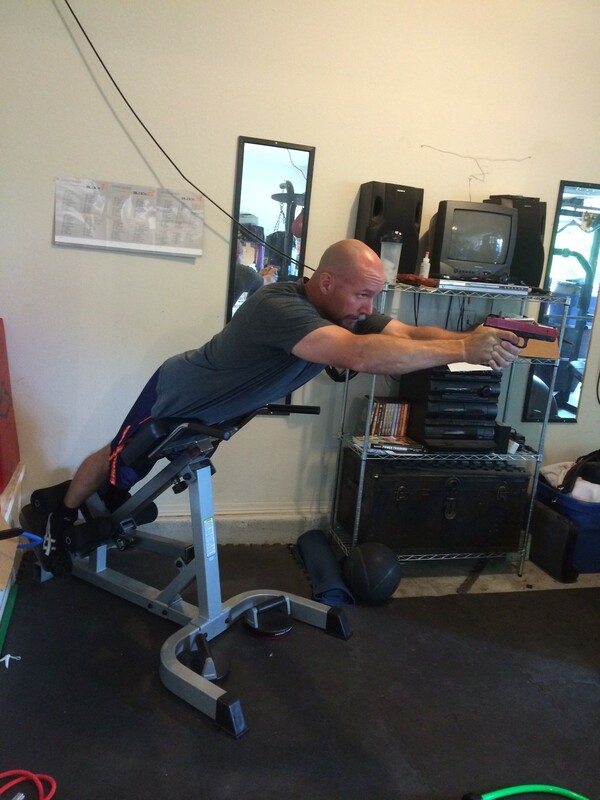 Each exercise is choses for its ability to work a specific area or skillset I find important. The last sets are less intense work as I am usually fatigued by that point. Note: You should know what your maximum heart rate before doing this workout, and each set should be done with maximum intensity. 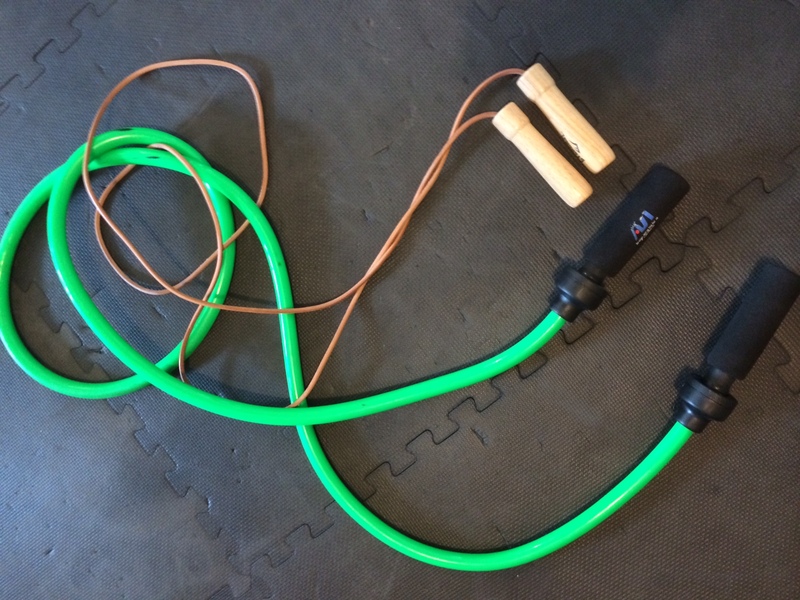 This picture shows the “heavy” and “light” jump ropes referred to in the circuit. Each exercise in this workout is one minute in length. Each rest set is two minutes in length, or long enough to allow the heart rate to return to 120 bpm or below. I recommend getting a timer (I have an app on my IPhone called IntervalTimer) that allows you to set the work and rest times with audio beeps. In addition, a heart rate monitor is highly recommended. Warm up (three minutes) on any machine, jog in place, or active pre-hab routine. Jump Rope (Light) Calves I have a heavy jump rope and a weighted one. “Light” in this set means that I use the non-weighted one. Jumping rope works the calves and increases your explosive movement ability. Speed Bag Shoulders A great upper body warm up, and in addition it develops great coordination and hand speed. Keep the non-striking hand up. 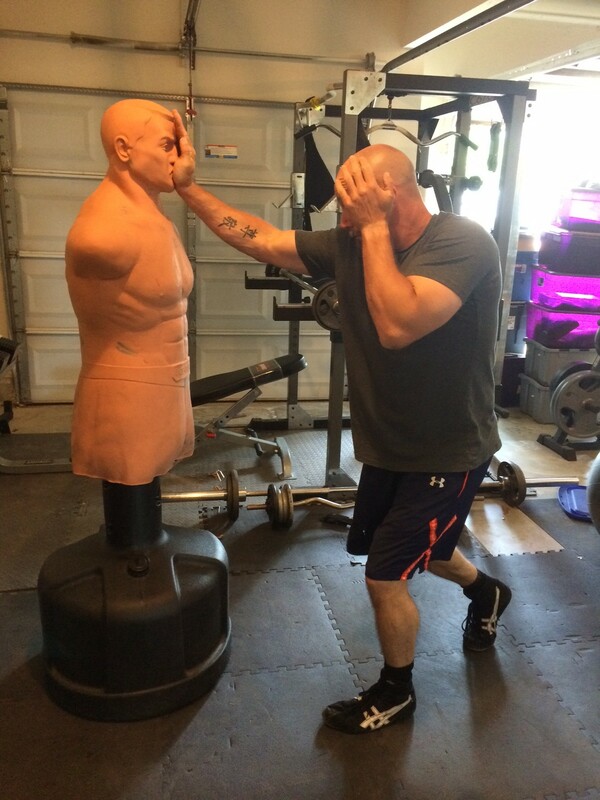 Learn how to hit a speed bag here. Hand Strikes (1-2-3) Combination Chest Stretch Use any combination you want, just make sure to make it as technical correct as possible. Knee Strikes Hip Flexors Drive the knees in on a straight angle. Elbow Strikes Rear Deltoids I strike forward and with a rearward strike with the back of my elbow. Just like the 1-2-3 combination, you can do whatever elbow strike meets your fancy. Jump Rope (Heavy) Hamstrings This set is done with my weighted rope (mine is alb). More explosive work for the calves, and this exercise is great for hand and wrist strength. Medicine Ball Slams Lats Use the abdominals and entire body to drive the ball into the ground. Hyperextension/SIRT combination Downward Dog (yoga) Do not over-extend beyond parallel or you will increase the stress on your back. Kettlebell Swings Upward Dog (yoga) Many believe this is the single greatest exercise of them all. Learn perfect form on this exercise before attempting. 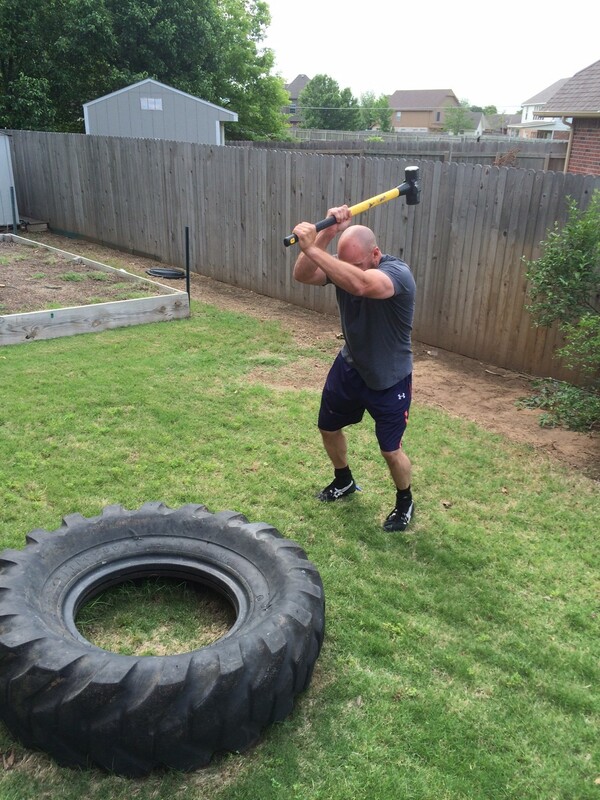 Tire Slams (with sledge) Downward Dog Alternate heels down. The single best grip/wrist strength developer that I have found. I use a ten pound sledge hammer. Neck Bridges Front Neck Rolls Turn the head from forward, to the right, and to the left every five seconds. Neck Bridges Rear Neck Rolls Turn the head from forward, to the right, and to the left every five seconds. Cool down (three minutes) on any machine, lowering the intensity 5-10 % each minute. Each work interval lasts one minute, but if I get both an incredible increase in heart rate, and a radical grip strength workout at the same time, I am in essence saving time. This exercise is one of the very best I have found for hand and wrist strength. Hyperextensions work the lower and middle back chain of muscles, and I like to insert a bit of SIRT trigger work so I get the benefits of both at the same time! Time is everything. I work my strikes during this workout, and stay as technically correct as I possibly can during the work set. This photo shows me working hard and keeping the non-striking hand high and protective. Great post – thanks for sharing! Bummer the dropbox link to the pdf is broken (there’s nothing there). Maybe it’s because it’s nearly 90 days after first publishing. What can I say? I get around to it… eventually. I’m going to check out a couple of local crossfit centers based on this, given that I’ve been considering it for some time now. Will balance with the triathlon events: running, cycling, swimming. Optimistic!